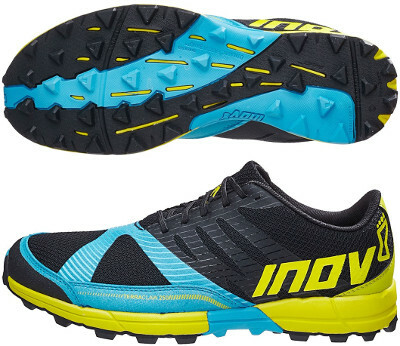 Inov-8 Terraclaw 250 are neutral trail running shoes. The new Inov-8 Terraclaw 250 (and its smaller sibling Terraclaw 220) have the difficult task to replace the Trailroc series from british brand to make people from around the World enjoy running over moderately technical terrains, preferably rocky ones. With 6 mm lugs, "standard fit" (aka wider toe box than old Inov-8 models) and 8 mm drop the Terraclaw 250 is a perfect choice for medium distance trails and fell running. Upper in Terraclaw 250 is made of breathable synthetic mesh with fused structure to provide enough consistency and custom fit around midfoot. Aggresive "X" design of welded overlays in forefoot (X-Lock™) is not only an eye-catcher but also an effective way to provide an snug and secure fit. Toe cap and both sides are reinforced to protect against external elements like rocks and brush while padded tongue is diagonally gusseted to reduce chance of debris and/or dust going inside. Midsole construction keeps typical Inov-8 simplicity with compressed EVA layer below 6 mm footbed featuring 2 arrows in Inov-8's ShockZone system which means a perfect blend of responsiveness and firm cushioning. Outsole is made of combination of multiple rubbers (DUAL-C™) with different endurance and sticky levels depending on the area. Multi directional lug pattern provides great traction even on muddy terrains.